ASEAN University Network/Southeast Asia Engineering Education Development Network (AUN/SEED-Net), which started in 2003 mainly supported by the Japanese Government through Japan international Cooperation Agency (JICA), has been making significant contributions, particularly in promoting higher education in the field of engineering through its various efforts – grants, industrial linkages and conferences. To date, AUN/SEED-Net has 26 member institutions form 10 ASEAN countries with assistance from 14 Japanese supporting universities. The recent 11th Regional Conference on Computer and Information Engineering (RCCIE 2018) with the theme “Sharpening the contribution of Computer Engineering and Telematics in Smart City to improve the quality of Human Life”, held from 26-27 November 2018 in JW Marriot, Surabaya, Indonesia, was an AUN/SEED-Net event that invited and sponsored researchers from member institutions to present their scientific results. 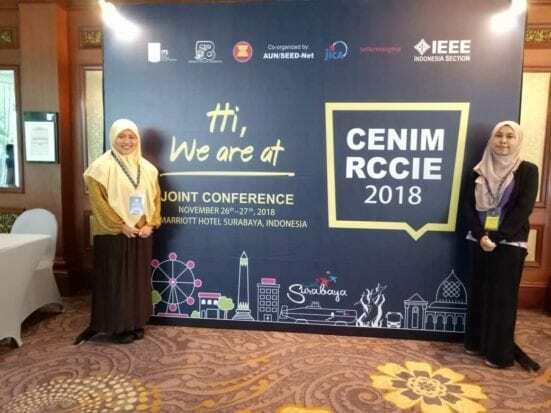 This conference was jointly-organised with the International Conference on Computer Engineering, Network and Intelligent Multimedia 2018 (CENIM 2018) organized by the Institut Teknologi Sepuluh Nopember (ITS). Out of 61 submitted papers, 38 papers were accepted for presentations at RCCIE 2018. All presented papers will be included in the ASEAN Engineering Journal (AEJ). The sponsorships were awarded to 21 recipients from various ASEAN countries, which cover conference fees, airfare, and 3-night accommodation. Two UTM recipients are Dr Masitah Ghazali (School of Computing) and Dr Dyah Ekashanti Octorina Dewi (School of Biomedical Engineering and Health Sciences), Faculty of Engineering. Dr Masitah presented a paper on “Creating Awareness of Energy Consumption via Peripheral Display”, where the project combines the Internet of Things (IoT) technology and Human-Computer Interaction (HCI). Dr Dyah shared her findings through her paper entitled, “CT Lung Parenchyma Selective Segmentation with Threshold-based Connected Component Labeling” as a part of her clinical research on Pulmonary Structural Characterization for Cardiothoracic imaging models. This AUN/SEED-Net conference has successfully provided a platform for researchers and academicians from ASEAN member countries to share knowledge and establish future potential work collaborations. We would like to thank AUN/SEED-Net for the opportunity and we also hope to organize a similar event in UTM, with a special focus on biomedical engineering. With one of keynote speakers, Prof. Masahiro Inoue (far left), AUN/SEED-Net recipient fellows from Malaysia, Thailand, Vietnam, Cambodia, program officers (third and forth from left), and conference chair, Dr. I Ketut Eddy Purnama (forth from right), during social program after Laboratory visit to ITS.